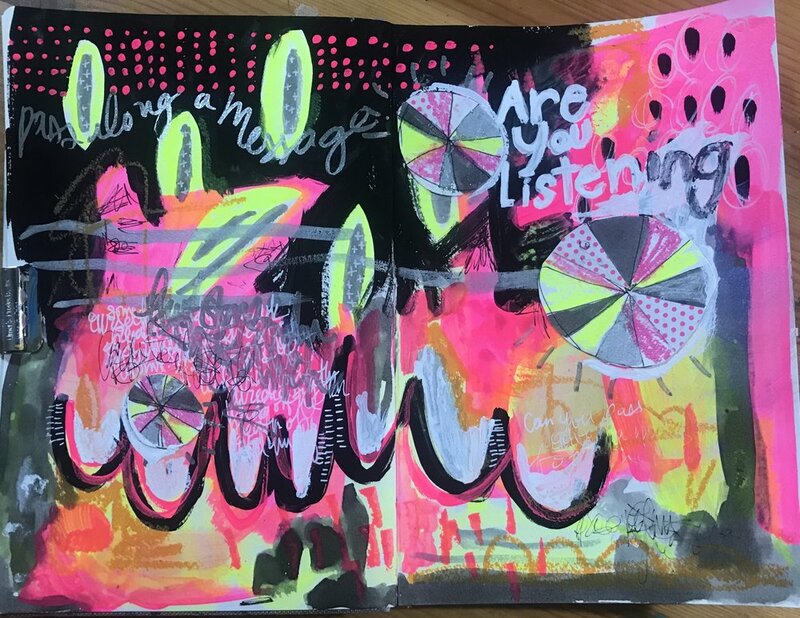 Every other week, Rebecca and I create or find a Mood Board and allow it to inspire a page or spread in our art journals. Don’t forget to check out her blog to see what she creates! This week, we went full on neon. Which isn’t surprising since those colors are the ones Becca likes best! I didn’t really sit down with a plan, but as I worked, I heard questions within me rise to the surface. It’s always interesting when the simple act of laying down paint allows your mind to clear and offer up that which has been stewing under the surface. This week I recorded with time lapse, which made this much shorter than I expected! Does this work better? Or do you like the sped-up-but-not-this-much videos I was doing before? Also, if I did a longer one talking about materials and techniques, would you’d support this on Patreon for a few bucks a month? I’m trying to figure out engagement with my lovely readers as I begin to emerge from the shadows of grief - or maybe, I’m just realizing how much art helps. Lt me know in the comments!